One of our specialty is working with children. 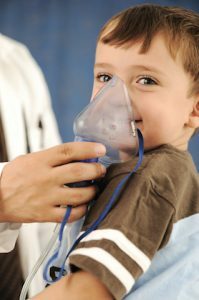 Sadly, our Phoenix area allergy doctors see respiratory illnesses quite often since they are very common for children, especially those who are younger than five! Believe it or not, most children develop between three and eight colds or other kinds of illness of the respiratory system each year! As you might expect, this number is even higher among kids who go to daycare, as germs and viruses can migrate between kids pretty easily. Tobacco smoke has also been linked to respiratory illnesses as well. Luckily, most of these illnesses are not serious and will go away on their own. There are some, however, that can have a lasting effect. If you suspect your child has asthma or pneumonia, you will need an evaluation and care plan from a specialized physician such as an allergist within the phoenix area. You can use the items in this guide to show you which of the respiratory illnesses are caused by an infection as well as how many are non-respiratory conditions. This will let you know when exactly your child needs to go to the hospital. For the lower respiratory system, that is basically the lungs and bronchial tubes of a person. Children under five will tend to experience much more severe symptoms that may require immediate medical attention. Some symptoms of this type of illness include rapid breathing, wheezing, and shortness of breath. If your child experiences any of these symptoms, especially if they’re under five, you should get them to a doctor immediately. This one is probably the most pervasive on this list, as it can be caused by upwards of 200 different viruses which are all capable of traveling from one person to another fairly easily. You might wonder why the common cold has yet to be eradicated, but we will tell you it’s because of the fact that there are so many different viruses that can cause it. Officially known as influenza, this can be a very serious, dangerous condition for children under five to go through, and it would be best to get to an allergy and asthma clinic. This disease also affects the upper respiratory system, but it has several key differences from the common cold that set it apart. Now that we’ve seen some of the upper respiratory diseases, let’s go ahead and take a look at some of the lower respiratory illnesses. RSV does start as an upper respiratory virus, but it tends to move into the lower respiratory system and cause illness in infants as young kids. It’s so common, in fact, that it actually affects more than 90 percent of all kids before they turn two. RSV usually manifests as nothing more potent than the common cold for many children. However, there are cases where the lower respiratory tract is affected and swollen. This causes there to be less room for air to pass through the lungs, which causes the poor kids to have difficult, wheezy breathing. There are a variety of illnesses that young kids can be afflicted with. Both the upper respiratory system and the lower respiratory system can be plagued by some kind of infection that could manifest as the common cold or be disguised as something similar while being more potent than the other form. It’s common and understandable to react to cold-like symptoms as being nothing more than a common cold in your child. However, there’s a definite possibility that the symptoms your child is experiencing could be the result of something more serious such as asthma or allergies! It’s always best to rather be safe than sorry. Especially if your child is experiencing more severe symptoms, or has symptoms that are lasting abnormally long, it’s best to get in touch with an asthma specialist or allergist who cares about its patients and puts their best interest at heart. Please call to reach out to us for an appointment if you would like to make your child healthy again! Our doctors have years of experience at handling these types of situations and specialize in pediatrics. We will help you and your child at our local Anthem Allergy & Asthma Clinic, or our Phoenix, Scottsdale, Glendale and Avondale clinics!